Only Nairobi disrupts the Asia-Pacific dominance. Although momentum in the global economy appears to have peaked, there are still many cities in the world where real estate and economic growth continue to be robust. 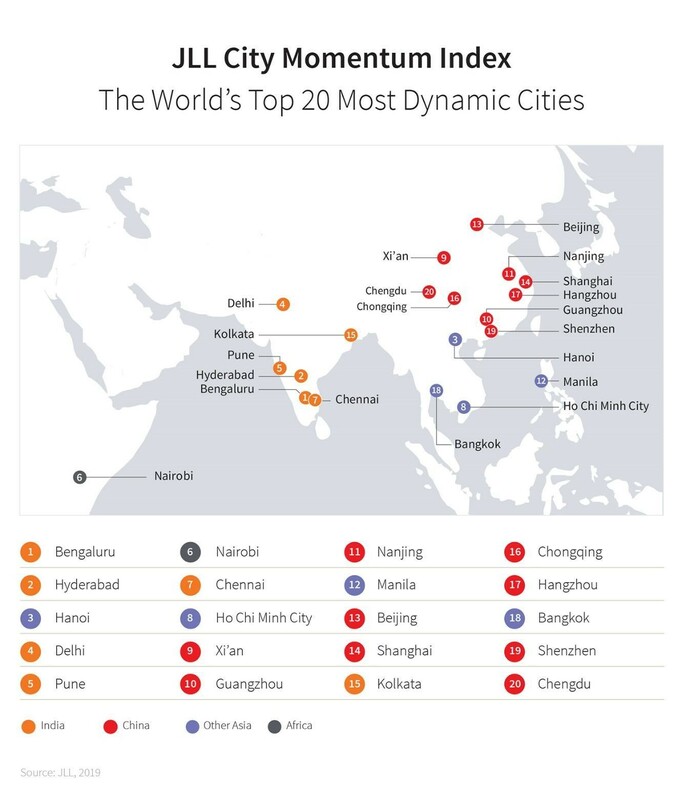 At the time when the World Economic Forum is examining globalization 4.0, JLL’s City Momentum Index, now in its sixth iteration, focuses on momentum for the world’s most commercially active cities. Tracking a range of socioeconomic and commercial real-estate indicators to identify attributes for success over the short term, the City Momentum Index ranked 131 major established and emerging business hubs across the globe to identify the urban economies and real-estate markets that are currently undergoing the most rapid expansion. This year’s rankings find the fastest urban growth continuing to shift away from the West to the East. Asia Pacific is home to 19 of the top 20 cities in this year’s index, and overall, Indian and Chinese cities dominate the rankings, accounting for three-quarters of the top 20. Only one city outside of Asia Pacific, Nairobi, ranks in the top 20 most dynamic cities in the globe – and even in Nairobi there is a strong Asian influence, with significant amounts of investment from China, particularly focused on infrastructure projects. Strong growth brings great opportunities for economic and social development, but equally creates challenges that emerging markets must address to ensure that short-term growth transitions into longer-term momentum. Cities that are growing rapidly tend to punch above their weight in attracting companies and people; however, this can often lead to social inequality, congestion and environmental degradation. Different cities take different development paths, but we know that the provision of smart, efficient and productive real estate and increased transparency are key factors in driving the long-term, sustainable growth they seek. Regeneration projects can dramatically transform the trajectory of a rapidly growing city. New neighbourhoods and mixed-use developments can help nurture new businesses and improve lives. In parallel, large-scale infrastructure projects can combat problems such as congestion, while smart technology embedded within a city’s infrastructure can help improve the flow of people. Nairobi (ranked 6th in the index) is projected to have one of the fastest-growing populations in the world over the next five years. The authorities there are turning to smart technologies to help cope with overcrowding, traffic congestion and inefficiency in transportation around the city. Technological innovation in the form of greener and smarter buildings plays an important role in answering the environmental challenges brought about by rapid growth. The Chinese city of Xi’an, (ranked 9th) struggles with severe air pollution, a common plight for developing cities. The installation of an innovative 100-metre-tall air purifying tower to reduce smog and improve air quality is one of the developments helping the city meet the challenges of growth. 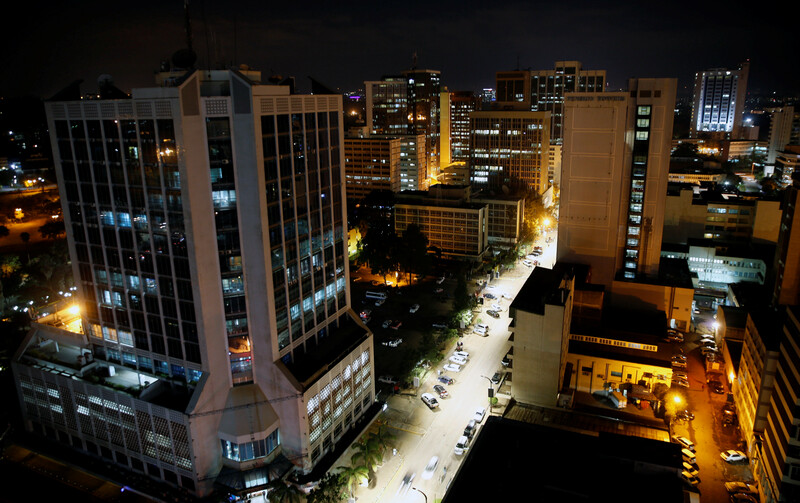 The central business district in Nairobi, Kenya. Strong growth and rapid urbanization can lead to many challenges, but through thoughtful and innovative development many of these challenges can be met. Sustainable long-term momentum and a maturing economy require long-term foreign direct investment, and this comes when investors can see transparent governance in markets – including real estate. India’s fastest-growing cities have been successful over recent years in attracting high levels of foreign direct investment (FDI), with structural reforms, including the Real Estate (Regulation and Development) Act 2016, encouraging more real-estate investment from foreign buyers. A similar story is playing out in Chinese cities such as Beijing and Shanghai, which are both on the cusp of joining the ranks of the world’s ‘Transparent’ real-estate markets according to JLL’s Global Real Estate Transparency Index 2018, published earlier this year. Transparency is vital in securing the long-term investment that leads to sustainable growth. By working with city governments, the private sector can help lead this change and bring benefits not only to the real-estate market but also to the wider commerciality of a city. Against a backdrop of rapid change, the World Economic Forum will examine globalization 4.0 and the Fourth Industrial Revolution with a definitive call to make global growth inclusive and sustainable. For growth to be both sustainable and inclusive, it must be long-term. 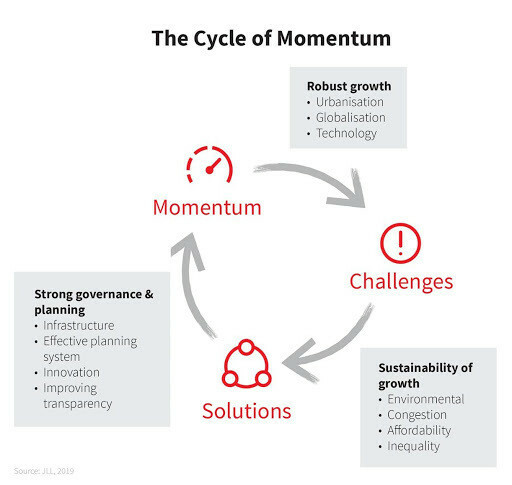 The City Momentum Index shows how businesses and governments can work together to make this happen.